Final round of the BSSO scooter racing championship next weekend Sept 23/24th at Cadwell Park , Linconshire. The bsso scooter racing championship is at Anglesey this weekend , only 30 mins from Llandudno. Is the sprint meeting at RAF Woodbridge for 24/25 June still on? What time does the sprinting start on both days? BSSO / Time Attack Scooter and car racing this Sunday June 4th at Snetterton , Norfolk. just back from Elvington airfield where straightliners have a top speed event today and tomorrow (sat and sun). 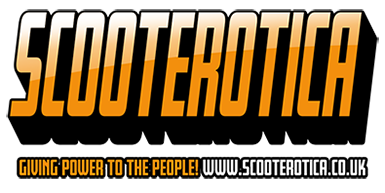 The scooter shootout event is this weekend at Elvington. Postcode YO41 4AU. Racing a scooter offroad up a big hill? When, where, does it still go on? Saw some clips 2 or 3 years back so not sure if it's an old time event or still an ongoing event. Race 3 and 4 (plus 1 red flagged) under my belt. Scooterotica tuned RB250 in a home assembled late Serveta LIS150 frame.